Congrats to our new Baseball Coach! Alum Chris George '95 returns to head varsity team! Congratulations to new Varsity Baseball Head Coach, 1995 grad and 2008 Hall of Fame Inductee, Chris George! At DB, Chris was an MVP and 1st Team All-Conference shortstop and a member of the AAA Conference Championship team in '95. After DB, he played in the Junior College World Series at STLCC-Meramec, after which he moved on to Mizzou. At Mizzou, he earned 1st Team All Big 12 Honors in '98 for relief pitching, as well as earned his Bachelor's in Economics. 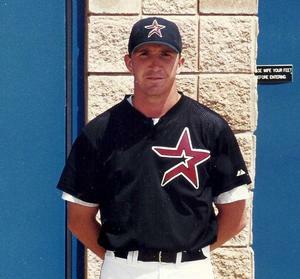 After college, Chris was drafted by the Houston Astros in '99 and led the team in saves in '00. He also later played for the Greek National Team and served on the coaching staff during the 2004 Athens Olympics. We are thrilled to have Chris back on our team! Welcome back!